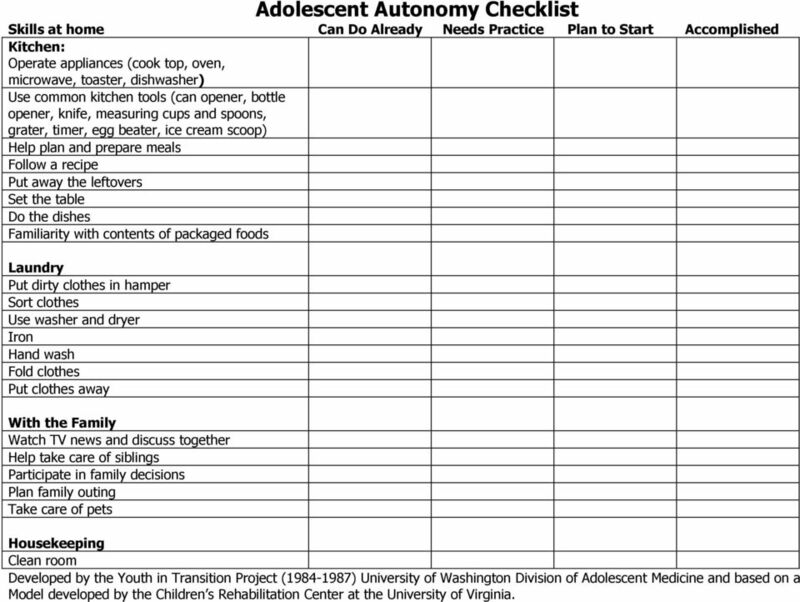 Download "Laundry Put dirty clothes in hamper Sort clothes Use washer and dryer Iron Hand wash Fold clothes Put clothes away"
1 Adolescent Autonomy Checklist Skills at home Can Do Already Needs Practice Plan to Start Accomplished Kitchen: Operate appliances (cook top, oven, microwave, toaster, dishwasher) Use common kitchen tools (can opener, bottle opener, knife, measuring cups and spoons, grater, timer, egg beater, ice cream scoop) Help plan and prepare meals Follow a recipe Put away the leftovers Set the table Do the dishes Familiarity with contents of packaged foods Laundry Put dirty clothes in hamper Sort clothes Use washer and dryer Iron Hand wash Fold clothes Put clothes away With the Family Watch TV news and discuss together Help take care of siblings Participate in family decisions Plan family outing Take care of pets Housekeeping Clean room Developed by the Youth in Transition Project ( ) University of Washington Division of Adolescent Medicine and based on a Model developed by the Children s Rehabilitation Center at the University of Virginia. Home. We have an equal right to live on our own, or with the people we choose, in the community, with the support we need. 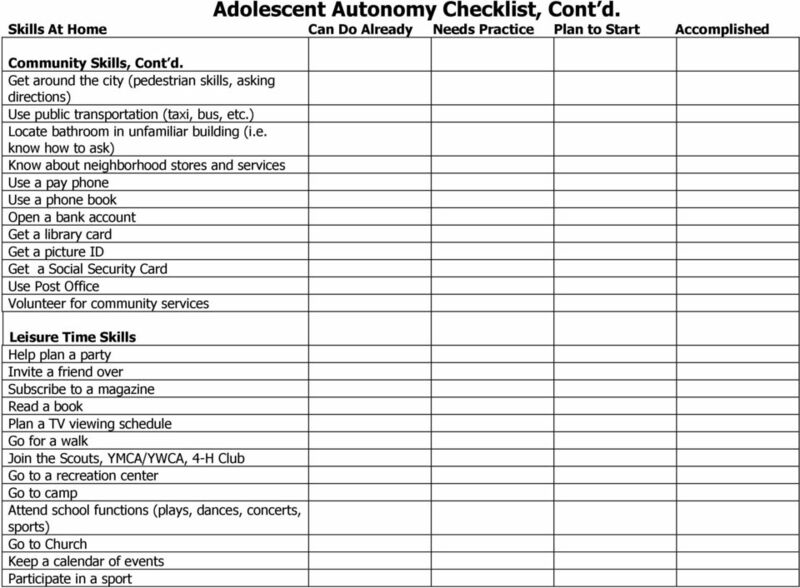 SECTION A- GENERAL INFORMATION. Your Number Message Number None. b. How much time do you spend with the disabled person and what do you do together? Writing outcomes for Education, Health and Care Plans. Karina Dancza Professional Advisor- Children & Young People karina.dancza@cot.co. Choosing an Assisted Living Facility: Comparing Apples to Apples! Click on a job title to see examples of descriptive information about the job. 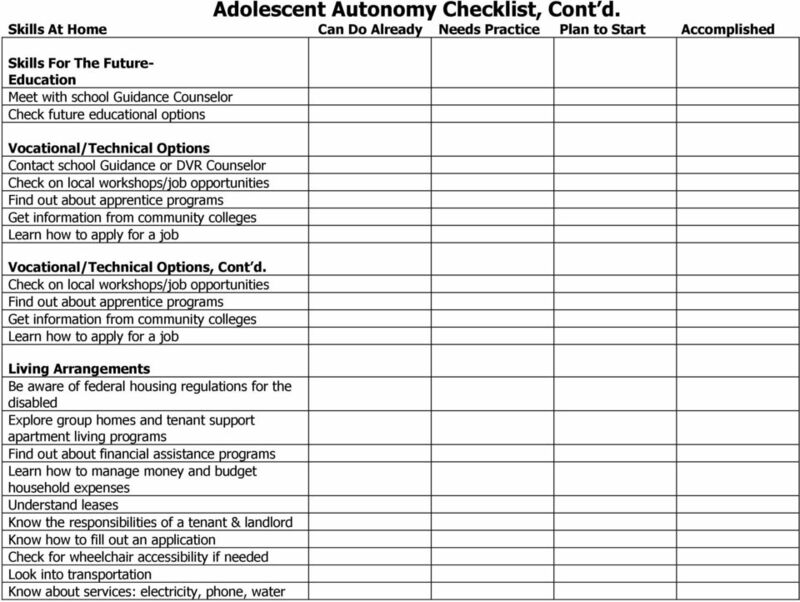 Click on a link between job titles to see the critical development experiences needed to move to that job on the pathway. NDIS Planning Tool Get Ready The National Disability Insurance Scheme (NDIS) began in Victoria with a trial in the Barwon region in 2013. Between 2016 and 2019 it will to roll out across all of Victoria. This guide lists. suggested questions. to ask when. interviewing a potential. service provider. c/o W.P. Industry Centre RR#1 Alberton, PE C0B1B0 P:(902) F:(902) W:communityinclusions. 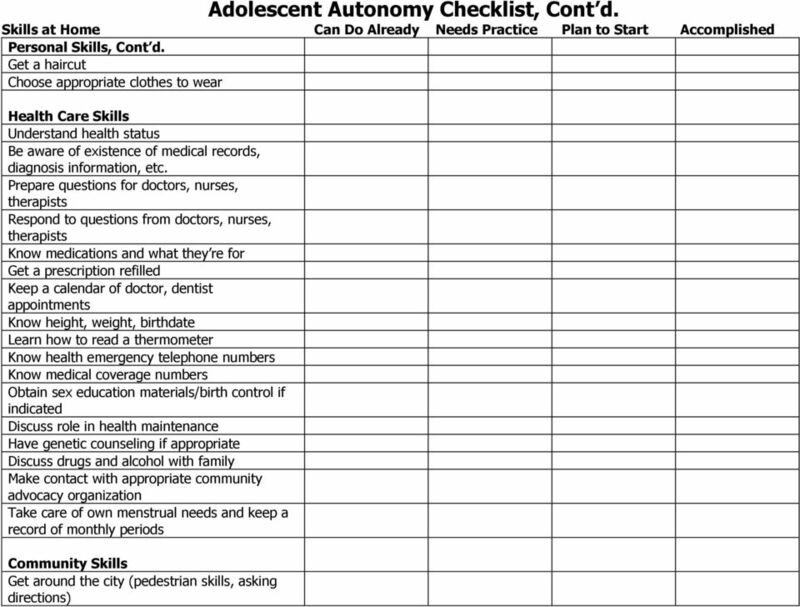 SELF-ADVOCACY CHECKLIST Instructions: The following checklist has been developed to assist in identifying a student s self-advocacy skills. Check the box for each item to which the student can reply yes. 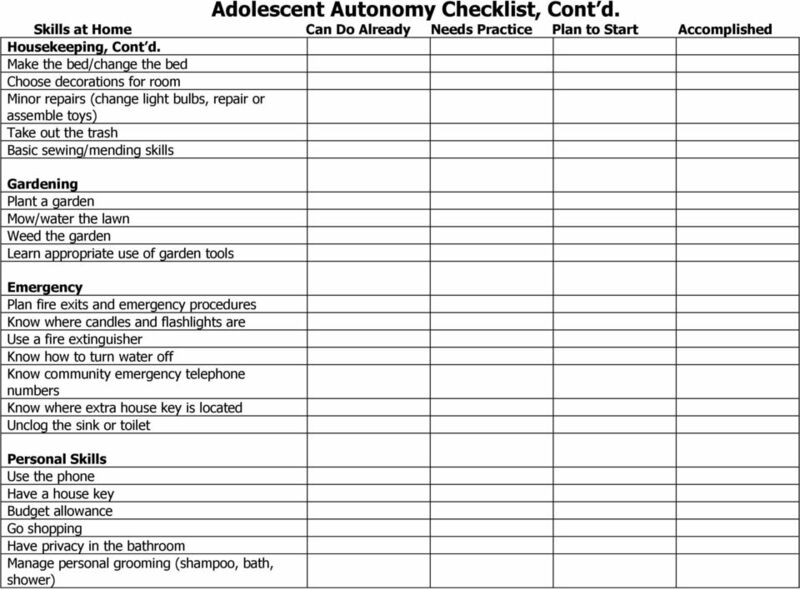 The TIDY Thorough Home Cleaning Checklist Over 345 items that you should consider cleaning in your home. Energy Efficiency, Let s Save Energy! BUDGET PLANNER NAME: DATE: Annual income twenty pounds, annual expenditure nineteen nineteen six, result happiness. Annual income twenty pounds, annual expenditure twenty pounds ought and six, result misery. YOUR RIGHTS & RESPONSIBILITIES AS A TENANT As a tenant, you have the right to live in a safe and clean environment. Your home should be in good repair and should have adequate water, heat, light, and toilets.